The Forty-fourth United States Congress was a meeting of the legislative branch of the United States federal government, consisting of the United States Senate and the United States House of Representatives. It met in Washington, D.C. from March 4, 1875, to March 4, 1877, during the seventh and eighth years of Ulysses S. Grant's presidency. The apportionment of seats in the House of Representatives was based on the Ninth Census of the United States in 1870. For the first time since the American Civil War, the House had a Democratic majority. The Senate maintained a Republican majority. 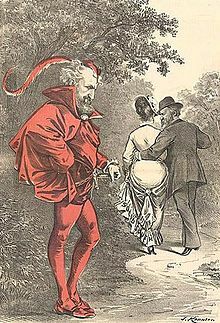 A political cartoon by Joseph Keppler depicts Roscoe Conkling as Mephistopheles, as Rutherford B. Hayes strolls off with a woman labeled as "Solid South"